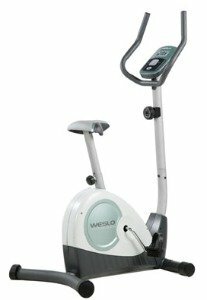 The Weslo Pursuit S 2.8 upright bike is priced between $129 and $169 at various online retailers as well as discount stores such as Wal-mart, Sears, and Costco. The LCD with Priority Display shows your feedback for speed, time, distance, and pulse. The console also has an RPM meter to track your revolutions per minute. UPDATE: The Pursuit S 2.8 model has been discontinued. 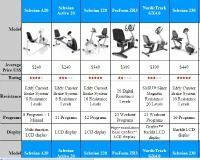 If you're interested in buying a Weslo exercise bike check out the selection of popular models on sale at Amazon. Features on the Weslo Pursuit S 2.8 include a quiet operation, a compact frame at just 36" long, and transport wheels to easily move it to a corner for convenient storage. Reviews on this Weslo upright bike give it credit for the easy to read LCD display, but there are more negatives than positives. 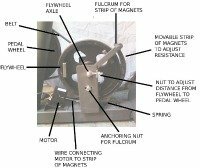 The pulse grips are not that accurate, and occasionally, the other readouts go haywire and give erroneous feedback as well. Worst of all is the seat – most reviewers remark that the bike is extremely uncomfortable. You can try a pillow or a gel pad, but a seat that feels this bad will give you a bad exercise experience and turn you off to doing your daily workouts. You may end up spending $50 or more just for a replacement seat. The 45-pound frame on the Weslo Pursuit S 2.8 upright bike is rather flimsy and we can’t imagine this little bike can hold a max user weight of 250 pounds as well as the pounding torque of a vigorous workout, for more than a few months. Another red flag is the weak warranty; the bike is only covered for 90 days after purchase – the worst in the industry. If you are limited in your budget to spending under $200 on an upright, we recommend you seek out better choices, starting with two strong upright models: the Stamina 5325 or the Schwinn A10.